When do we pay the accommodation charges? When checking in or in advance, we ask our guests to pay the charges. Can we get on the waiting list? What kind of amenities and facilities are there in the room? Can we use vouchers or gift certificates? Do you handle foreign money exchange? Do you charge accommodation fee for preschool child? One preschool child can stay free. Do you have beds for babies or infants and fences for them to prevent from falling or amenities for children? We do not have beds for babies or infants or a fence for them to prevent from falling or amenities for children. Can we change the registered information by phone? We do not accept change of information by phone. Can we make reservations by phone at the rate offered at the official website? We accept reservations only at the normal rate by phone. Since the rates offered at the official website are limited to accommodation charges or special price, we request you to make reservations at the website for those rates. Could you keep our baggage? We keep our guests’ baggage before check in and after checkout at the front desk. We ask our guests to pick up their baggage on the day of checkout. Can we use home delivery service? We take the request of delivery at the front desk. As the front desk is busy with many guests at the time of checkout, it may take time to arrange the delivery. Since we accept the request for 24 hours, we ask our guests to avoid the checkout time to give us the request for delivery arrangement. Can we send our baggage beforehand by delivery service? Please write the date of accommodation and the guest’s name on the delivery slip. We keep the baggage at the front desk. *We are unable to accept delivered goods that must be refrigerated or frozen or cash on delivery. Can we go in and out around the clock? We have no curfew, but we lock the door from 1 a.m. to 4:30 a.m.. Please be sure to have the card key with you when you go out after 1 a.m. When you hold the card key over the card reader next to the automatic door, the door will be unlocked. How should we take care of our valuables? Please keep them whenever you go out. Otherwise, we keep them at the front desk. Could you lend us a PC or DVD recorder? 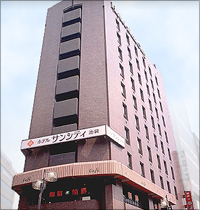 Our guests can use a PC for 1,000 yen per day. A portable DVD can be lent for 500 yen per day. We have no DVD recorder. We have a microwave oven in the lobby. We have no parking lot, but there are coin-parking lots close to the hotel. They are not affiliated with our hotel, and we are unable to accept the reservations. Can we make a copy or send a fax? We take the request at the front desk for fee. We have no coin-operated laundry. If our guest brings items to the front desk by 10 a.m., the laundry will be finished around 9 p.m. on the same day. The charge depends on the item.